Why BLUDGEON cancer to death with common conventional treatments that can be toxic and harmful to your entire body? When you OUTSMART your cancer, only the cancer cells die – NOT your healthy cells! 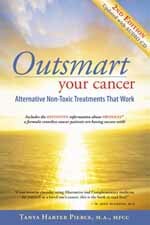 OUTSMART YOUR CANCER: With Alternative, Non-Toxic Treatments That Work is an easy guide to successful non-toxic treatments for cancer that you can obtain right now! In it, you will read real-life stories of people who have completely recovered from their advanced or late-stage lung cancer, breast cancer, prostate cancer, kidney cancer, brain cancer, childhood leukemia and other types of cancer using effective non-toxic approaches. This book explains in an easy to understand way the successful approaches these people used. It also gives you information about how to obtain these treatment approaches right now, as well as how much they cost! You will also learn other valuable information, such as What Women Need to Know about their Hormones and Cancer What Men Need to Know about the PSA and Prostate Cancer The importance of Alkalizing Your Body The Connection Between Toxic Teeth and Cancer How to Evaluate Mainstream Conventional Treatments Plus, OUTSMART YOUR CANCER: With Alternative, Non-Toxic Treatments That Work is one of the few books in print today that gives a complete description of the amazing formula called “Protocel,” which has produced incredible cancer recoveries over the past 20 years! This book can save you valuable research time, and help you make a truly informed decision!! Every book includes the 75min Audio CD “Everyday Miracles – How 12 Ordinary People Outsmarted Their Cancer” In this Audio CD you will hear 12 people tell how they survived cancer in their own words. You will also hear cancer treatment tips from the author in her own words. Note: All of the information from “The Protocel eBook” is also contained in this full length book.